The President of the United States of America, authorized by Act of Congress July 9, 1918 (amended by an act of July 25, 1963), takes pride in presenting the Silver Star (Posthumously) to Sergeant First Class Benjamin L. Sebban, United States Army, for conspicuous gallantry and intrepidity in action against the enemy while serving as a Senior Medic with Headquarters and Headquarters Troop, 5th Squadron, 73d Cavalry Regiment (Airborne Reconnaissance), 82d Airborne Division, by placing himself in a position of danger to ensure his unit's welfare during combat operations in support of Operation IRAQI FREEDOM. ​Hometown: Amboy, New Jersey, U.S.
Died: March 17, 2007 in Operation Iraqi Freedom. Unit: Army, 5th Squadron, 73rd Cavalry Regiment, 3rd Brigade Combat Team, 82nd Airborne Division, Fort Bragg, NC. Sgt. 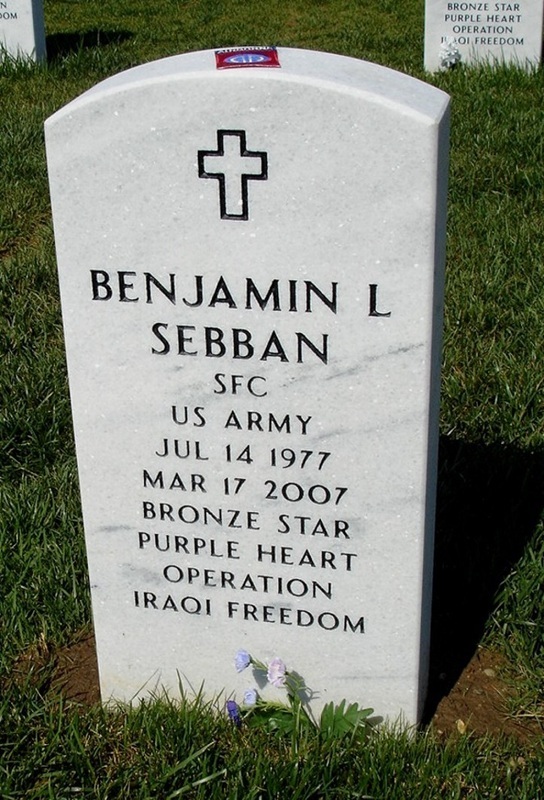 1st Class Benjamin L. Sebban of South Amboy, N.J., was born in Tunisia, North Africa as a U.S. Citizen and moved to South Amboy with his mother at age 4. He attended St. Mary's Elementary School and was a 1996 graduate of the East Brunswick campus of the Middlesex County Vocational-Technical High School system. Ben came back to visit the school some years later when a wake was scheduled for a classmate who had died in Kosovo. He was listed as an alumnus of Word of Life Fellowship, a ministry committed to reaching youth with the Gospel. His awards and decorations include the Bronze Star Medal, the Purple Heart, the Army Commendation Medal with three oak leaf clusters, the Army Good Conduct Medal with one clasp, the Army Achievement Medal with 3 oak leaf clusters, the National Defense Service Medal, the Iraqi Campaign Medal, the Global War on Terror Expeditionary Medal, the Global War on Terror Service Medal, the Noncommissioned Officer Professional Development Ribbon, the Humanitarian Service Medal, the Army Service Ribbon, the Overseas Service Ribbon, the Combat Medical Badge, the Expert Field Medical Badge and the Parachutist Badge. He was 29. The President of the United States of America, authorized by Act of Congress July 9, 1918 (amended by an act of July 25, 1963), takes pride in presenting the Silver Star (Posthumously) to Sergeant First Class Benjamin L. Sebban, United States Army, for conspicuous gallantry and intrepidity in action against the enemy while serving as a Senior Medic with Headquarters and Headquarters Troop, 5th Squadron, 73d Cavalry Regiment (Airborne Reconnaissance), 82d Airborne Division, by placing himself in a position of danger to ensure his unit's welfare during combat operations in support of Operation IRAQI FREEDOM, on 17 March 2007, in Diyala Province, Iraq. On that date, Sergeant First Class Sebban safeguarded the lives of 86 paratroopers during a suicide-car-bomb attack on a combat outpost. Sergeant First Class Sebban noticed a civilian truck accelerating toward the compound laden with explosives. Stepping from behind a Humvee, he moved toward the vehicle and warned his fellow paratroopers of the impending attack yelling three times until the explosion from the vehicle knocked him down. 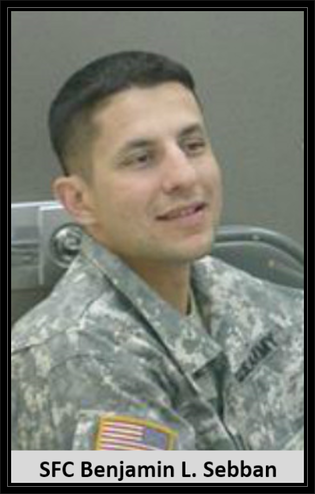 Although mortally wounded by shrapnel injuries to his abdomen, groin and legs, Sergeant First Class Sebban immediately moved to the aid station to begin treating his fellow wounded paratroopers until he collapsed and succumbed to his wounds. Sergeant First Class Sebban's valiant actions prevented enemy insurgent forces from overrunning his position and caused the enemy element to retreat. 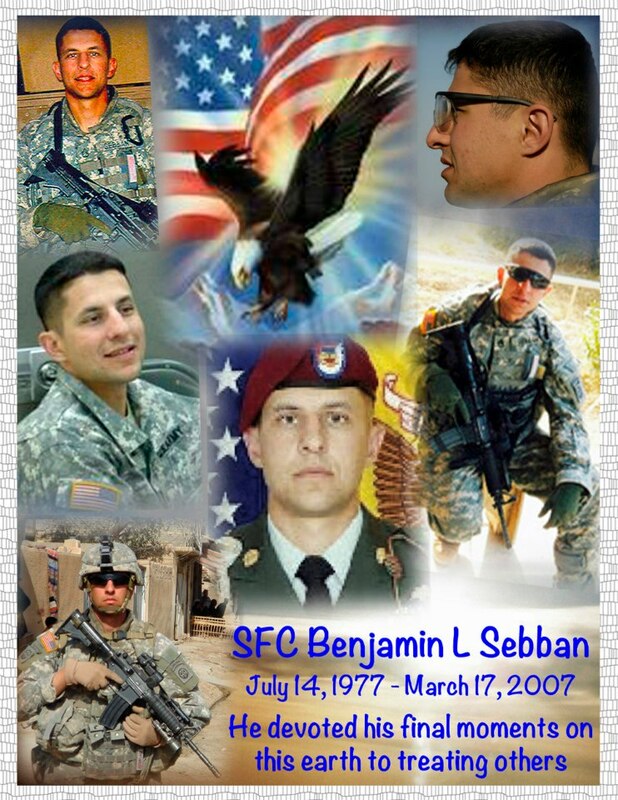 Sergeant First Class Benjamin L. Sebban died on March 17, 2007, while serving in Baqubah, Iraq.